Emotional Intelligence (EI) is currently a flourishing area in positive psychology and research has shown it is associated with academic achievement (Banchard in press, Bracket, Mayer & Warner, in press, Lam & Kirby, 2002), a decreased likelihood of aggressive behavior (Bracket & Mayer, 2003) and positively relating to others (Cote, Lopes, Salovey & Bears, 2003). Additionally EI has potential use in education (Sel, Elias, Hunter & Kness, 2001, Payton et al., 2000) human resource management including teamwork and building positive relationships with others (Cote, Lopes & Salovey, 2003), and in politics including the effect of emotion on decision making and behavior (Marcus, Neuman, & Mackuen, 2000) and family dynamics (Elias, Tobias, & Friedlander, 1999). Thus EI is an important subject to examine with many useful applications. This article will briefly describe two current models of EI; the ability model (Mayer, Salovey, 1997) and the Emotional Social Intelligence Model of EI (Baron, 2006) and describe supportive research evidence for each. It will then briefly describe two measures based on these models. Lastly research issues and future considerations in this area will be discussed. The study of EI developed through the area of cognition and affect, looking at how emotion affected thought. Initially it was believed that emotion had a detrimental effect; however, in time it was considered that emotion could also be adaptive to thought (Mayer, 2000) and that they could complement each other (Mayer, Salovey, 1990, Mayer, Dipaolo & Salovey, 1990; 1990 as cited in Mayer, 2000) Mayer and Salovey (1990) developed their first theory of EI, which subsequently became popularized by Goleman (1996). Goleman proposed that EI was integral for life success. Since then, several theories have emerged with conflicting views, and subsequently, different measures (Matthews et al., 2004). Mayer and Salovey (1997) proposed that EI was a cognitive ability which is separate but also associated to, general intelligence. 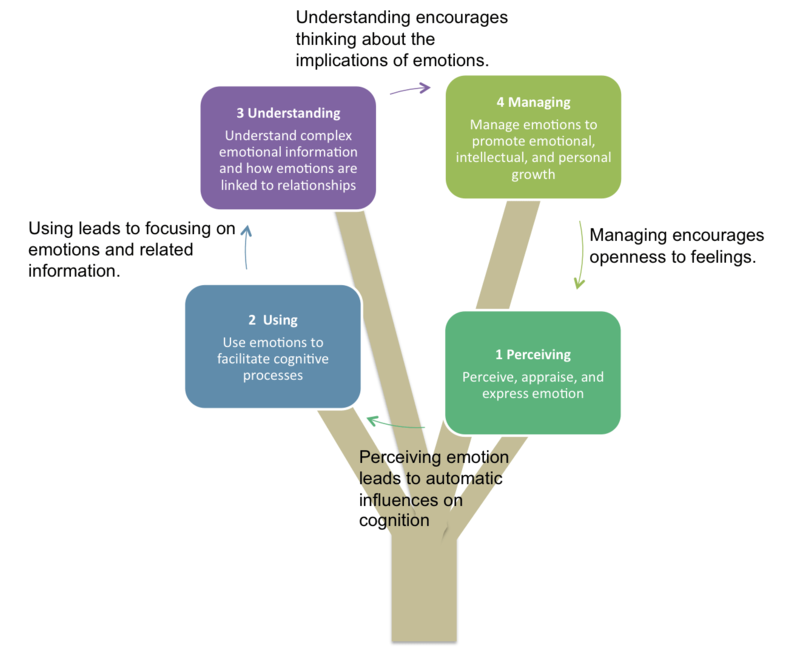 This model consists of four different abilities (or branches) including; perception of emotion, emotional facilitation, understanding emotions, and management of emotions (Mayer & Salovey, 1997). These branches are ordered from basic to higher-order abilities which develop as an individual matures (Mayer & Salovey, 1997). Emotion perception is the ability to perceive emotions in yourself and others. It also includes perceiving non – verbal signals, and emotion in stimuli such as landscapes and art (Mayer & Salovey, 2003). changing mood helping individuals to see a situation in several different ways. Thirdly facilitation assists different types of reasoning (Mayer & Salovey, 2003). Understanding emotions involves knowledge of emotions; emotional vocabulary; and how they blend to create other emotions which change overtime. Managing emotions involves the ability to manage your own emotions and those of people around you (Mayer & Salovey, 2003). Supporting this model, Mayer, Salovey and Caruso (1997 as cited in Sternberg, 2000) asked participants to judge the emotional content of several stimuli (e.g. faces, designs and colours). Participants consensually identified emotion in all these stimuli, supporting the emotion perception branch. In another study, Lane, Quinkin, Schwartz, Walker and Zeblin (1990 as cited in Sternberg, 2000) found that participants, who performed well at responding to hypothetical emotional situations, were higher in emotion perception and lower in alexithymia, supporting both the managing and understanding emotion branches. You can read more here about this scale. and lastly general mood (including happiness and optimism) (as explained by Bar-On, 2006). Overall, Baron (2006) proposed that ESI primarily consists of being able to understand yourself and others around you, to cope with daily environmental demands and to problem solve in changing situations. Fascinating empirical evidence supporting this model comes from studies of neurological patients who have experienced damage to certain areas of the brain (the Ventro-Medial (VM) prefrontal cortex, amygdala and somatosensory cortices). These areas are associated with emotional signalling, and making effective personal and interpersonal decisions (Bechra, Tranel, Damasio & Lee, 2000 as cited in Bar-On & Parker, 2000). A famous clinical case study was of Phineas Gage (Harlow, 1848 as cited in, Bar-On & Parker, 2000) who suffered an injury to his VM prefrontal cortex. After this his behaviour changed radically, losing interpersonal skills such as being responsible and reliable. More recently, Baron, Tranel, Denburg and Bechara (2003) gave the EQ-i, decision making measures (the gambling task), social functioning and cognitive intelligence measures to patients with VM prefrontal cortex, amygdala and somatosensory cortices lesions. Patients with damage to these areas showed low EI and difficulties in social functioning, although they had normal cognitive intelligence (Bar-On et al., 2003). This shows that EI may be distinct from cognitive intelligence, and that EI is important to both personal and social functioning (Bar-On et al., 2003). The MSCEIT is an ability measure of EI based on Mayer and Salovey’s (1997) model consisting of 141 items. It measures the four branches giving a total EI score, two area scores (experimental; including perception and facilitation, and strategic; understanding and managing emotions) and separate task scores (Mayer, Salovey, Caruso & Sitarenos, 2003). Each branch is measured through two tasks. Emotion perception is measured with the use of a faces and a picture task. Whereas using emotions is measured through a sensations task and facilitation task. Understanding emotions is measured through an emotion changes task and a blend task, and managing emotions is measured through emotional management tasks for individuals and others; (Linely & Joseph, 2004). Research has found that the MSCEIT has good reliability over time (Brackett & Mayer, 2003) and good internal consistency for overall scores on the measure and branch scores (Mayer et al., 2003). However the internal consistency of task scores are varied (Mayer et al., 2003). An advantage of this the MSCEIT is that it has been found to be separate from other psychological constructs such as personality (Brackett & Mayer, 2003, Warwick & Nettlebeck, 2004) and psychological well-being (Bracket & Mayer, 2003) which is advantageous. Although it does have disadvantages such as no young person’s format and its doesn’t seem to measure all the elements of Mayer and Salovey’s (1997) ability model. McEnrue and Groves (2005) explained that although perception of emotions and understanding emotions are measured, recognising your emotions, and interpreting honest and dishonest expression are not. Additionally it does not measure skills of emotional regulation (Lopes et al., 2003) which are important for practice (Matthews et al., 2004). This needs consideration in both research and applied settings. Another self-report measure of EI is the EQ-i (Baron, 2006). This consists of 133 items with fifteen different subscales, one for each of the competencies and abilities mentioned earlier. It gives a total ESI score and fifteen separate subscale scores. These are converted into standard scores similar to those of IQ (Bar-On, 2006). Additionally the scores are normed against over four thousand individuals (Bar-On, 2006). It is available in short format, and is suitable for people aged seventeen years and older. It also has a measure for children and adolescents (Bar-On, 2006). To compensate for social desirability bias, the EQ-i adjusts scores to give a more realistic result (Bar-On, 2006). However the EQ -i also has some disadvantages. Firstly it’s high correlations with traits of personality subsequently decreases its validity as a separate measure of emotional intelligence (Mathews et al., 2004, O’Connor & Little, 2001, Newsome, Day & Canto, 2001). An additional area of concern for the EQ-i is its vulnerability ‘faking’ (Day & Carroll, 2007). They found that during a job application simulation, individuals were able to enhance scores, and individuals who faked their scores were more likely to be selected for a job. Additionally they found that the social desirability scale seemed ineffective. This shows the serious implications of using this measure in applied settings such as job selection (Day & Carroll, 2000). In general there are some research issues in the area of EI needing consideration. The majority of studies are cross-sectional, highlighting the need for longitudinal studies, as a measure’s validity could change over time (Howitt & Crammer, 2005). In addition, the measures test- retest scores are based on weeks and months which may not be long enough. Most samples used consist only of college students, making it difficult to generalize the findings. Furthermore there is frequently an imbalance of females to males, which could bias results. More generally, the EI construct needs a conceptual base, and there is a lack of research examining the relationship between both self report and ability measures (Mathews et al., 2004) which is important to EI’s construct validity (Howitt & Crammer, 2005), and research so far has shown little correlation between these (Matthews et. al., 2004). Due to the two separate views; ability and mixed models, it is difficult to measure this construct consistently (Matthews et al., 2004). One area which has not been rigorously researched is how people actually react in real emotional situations (Lopes et al., 2003). Could it be possible that although an individual is high in EI according to a measure, when in an emotionally arousing situation, will they react differently? Future research needs to address this. Over all, EI is a rapidly growing field and both the ability and ESI models have helped to underpin a wealth of research on the subject, and the measures (the MSCEIT and the EQ -i) have great potential in several fields of practical application. However EI needs a conceptual home as there are contradictory views of what emotional intelligence actually is. Additionally both types of measures need more rigorous research before they can be evaluated as psychometrically sound (Matthews et al., 2004). Nonetheless the development of the validity and reliability of these measures is sure to grow and help to develop the thriving area of emotional intelligence. Success! We will keep you posted.